I have a problem and I think I’m not alone. In the process of trying to raise my energy vibration and create positive forward movement in my life I keep running into the same awful truth. I am carrying a LOT of extra weight! No, I don’t just mean weight on my body. I mean emotional weight. I mean financial weight. I mean the weight of things. Look up from the screen for a moment and gaze around whatever room you are sitting in. How many things, how many objects, do you see? Maybe you didn’t consciously realize that they were there, while you were staring down at the screen. Now, imagine the same exercise, but differently….imagine looking around the room you are sitting in and seeing only a nice clean side table with a vase on it. Or an empty wall, adorned with one large, beautiful painting and a curtain billowing softly near the window, nothing else. Feels nice, doesn’t it? Do you suddenly feel just a bit more relaxed, more comfortable in your own skin? Less distracted? If so then you have just felt the weight of things or, rather, the putting down of that weight. For most of us, we have been raised to believe that the pursuit of happiness means the pursuit of things. So much so that we rarely question the truth of it, while going about the IKEA or the Walmart or the shopping mall, or perusing Etsy, Ebay and Amazon. We just need things. Of course, everyone needs things. Sure. Leaving aside the conflation of need with want, let’s just ask ourselves one question: What do your things really do for you, once you’ve acquired them? If you’re like most of us the answer is, not much. Once we acquire something it entertains or serves, perhaps for a few hours, days or weeks and then, eventually, it falls into the background. It gets added to the collection of things. It creates a new base level, upon which the pursuit of the next need is built. It is, in all truth, an illusion. It didn’t make us happy. We didn’t need it after all. Now, being a pro-shopper myself, I am not casting aspersions here. Just making observations. So let’s look a bit deeper. As we accumulate things, whether things we use every day, once per season or never, they add up. Drawers fill, bookshelves bulge and cars become rolling storage units. Still, we may rarely get the time to pause and ask ourselves whether this is a lifestyle we are willing to accept. It just is what it is. And, we’re not the only one living this way, so it must just be normal. Right? Perhaps so. Call it clutter, call it consumerism, call it affluenza. No matter what you term it, the truth is that the majority of us in the industrialized world are suffering from stuffitis! We are living with more and more physical possessions and spending more and more of our waking hours working to pay for it all. The average American has four credit cards in their wallet and not enough time or money for “vacation.” Vacation, the time when we vacate the life we have created in order to head off and briefly live the life that we actually want. Back to my problem. I live in the biggest house I’ve ever lived in, with one of the smallest loads of stuff that I, personally, have ever possessed and guess what? It’s still too much! My mind is drowning! I’ve begun suffering from anxiety for the first time in my life. I’ve gained weight. My energy is trapped in a cycle of low vibration. My to-do list is full of things I never have the mental or physical space pursue. My moods are often on a scale between wishy washy and unpredictable. Truly, until I began walking the path of mindful living and deliberate ascension, I never saw a correlation between these things. But, now it is blatant and clear. When you own a thing, aren’t you it’s master? Don’t you have the power over it, to move, use, break or discard it at will? One would think so. But, on the level of energy and manifestation it is not always the case. All manifest things are of equal value to the Universe, to the Creator. Even if you are the being with a higher vibration and a higher consciousness, you will still co-mingle your energy with anything you come into contact with. Add a LOT of things, then that’s a lot of little co-minglings. That’s a lot of energy. Once you have a plethora of things stacking up, it can begin to feel like a monolith, practically immovable. Add to that the fact that whatever item you take possession of, whether a spoon, a shirt or a car, will never be responsible for you. But, the instant you take ownership, you become responsible for it. You are it’s keeper. You must keep it in your mental catalogue, its whereabouts and its state of repair must be known. Let’s do a couple of exercises together. Just to illustrate a point. Exercise #1: Imagine your closet (or bookshelf, or medicine cabinet, or pantry cupboards.) How many items are in that one location, roughly? 50? 100? 200? More? Exercise #2: Pretend you are sitting in your living room, wrapping Christmas gifts and you need the scissors. Where can you find them? I bet you know right away. Did you picture the drawer they live in? Did you see your hand on the drawer handle? Did you picture your exact pair of scissors, the white one with green handles and daisies all over them? Or the red-handled utility scissors from Staples? Yep. You had all of that information catalogued in your brain. Just for that ONE item! Multiply that by the number of items mentioned in the first exercise and that’s a whole heck of a lot of mental space! Now add in the rest of your things, your kid’s things, your husband’s things, the things in your office at work and you get to a pretty high level of stress and responsibility before you’ve even woken up to look at your daily to-do list or made that annual glance at your ever-growing bucket list. Always wanted to write a book but haven’t done it? Can you put your finger on a why? I’ll venture a guess: 50% fear of failure and 50% too busy and tired from acquiring and maintaining things! Yup, things. Things and stuff. Stuff stuffs up your mind and saps your energy. Stuff increases your inertia and procrastination by at least 50%. That’s my rough estimate. No wonder modern people complain of lack of time most often, even with all of our faster services, technology and helper gadgets. We are overwhelmed. If you want to raise your vibration, increase your energy and reclaim some of your time and space from the weight of things, where can you start? Well, for myself, the long and slow push towards relinquishing the hold that things have on me began with the urge to “declutter.” My guru for that stage of my journey was the very funny Don Aslett, a cleaning company owner and author who founded the Museum of Clean, in Pocatello, Idaho. I am the child of one very talented packrat and one mild-mannered hoarder, from a long line on thrifty farmers and resourceful WW2 wives. Trust me when I say that getting rid of things is NOT in my blood. But, Aslett made such funny points in his books and just made it easy to approach my stuff with a keener eye. I took 10 carloads of things to the Salvation Army Thrift Shop. This was followed by years of world travel, which helped me keep things on the lighter side. But, then came marriage and kids and buying a house. Needless to say, THINGS happened. Lots of things. Baby things, toy things, kitchen things, garden things, tool things, car things, winter things, summer things, parenting book things, school things, work things. Things, things, things! So, having recently come up for air, and become single again, I asked myself where all my time for blogging and podcasts had gone and why I spend all day cleaning a house that never is and shuffling my kids off to play without me. And, I’ve finally realized that it is a fundamental change that is needed. There is no single round of decluttering that will release you and your energy out from underneath the weight of things. It is the relationship with things, in and of itself, that must be altered. As a result I have taken a look into minimalism. Not the stark-white-walled-home-with-a-single-aloe-plant-and-a-Poang-chair-in-the-middle type of minimalism but the wow-we-don’t-really-use-most-of-this-anyway type of minimalism, where you begin to understand your relationship to things and how pairing down what you own, along with pairing down what you buy, is not actually a type of lack but, rather, a type of true abundance. I could wax quixotic about this all day, but I won’t. Instead, I will skip the sales pitch and just give you some of the tools and approaches that I am finding useful as I try to go from Clutterbug to Minimalist. As you go through your things and look for inspiration to do so, you will undoubtedly come across pieces of advice on how to make your decisions about what to keep and what to let go of. Every book on clutter and minimalism has it’s own gem and each one will come in handy in some situations, but not in others. The same is true of this approach. It can be used for almost any item in your house, excepting maybe sentimental and heirloom items. I use it for “collections”, like books, tea cosies, GI Joe figurines or Franklin Mint plates. (Honestly, I only collect one of those things, but you get the picture.) It is very helpful for things that you deliberately purchased, or were gifted, too many of, multiples that were deliberate. It works just as well for things you used to think you needed, like a shoe horn, an ice cream maker or a bacon press. If you wouldn’t, then out it goes. Thrift it, Gift it, Ebay it or Recycle it. Here’s how to do it: Pick up the item, peruse all of it’s colours, features and supposed benefits. Then ask yourself, “Would I buy it now?” Picture yourself clicking “But It Now” on Ebay and tapping in your credit card numbers. If you wouldn’t, then out it goes. Thrift it, Gift it, Ebay it or Recycle it. Sounds easy, but it won’t be. At least not for every item. Though it does tend to make the initial step of decision-making easier because asking yourself if you would buy it now is an intellectual process, not generally an emotional one. 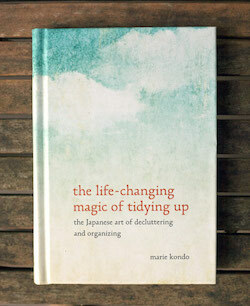 By now you have probably heard of the bestselling book The Life Changing Magic of Tidying Up by Marie Kondo, a Japanese cleaning expert. Even if you are not interested in minimalism, or weren’t until now, you can’t really avoid the book or the trend it has inspired. 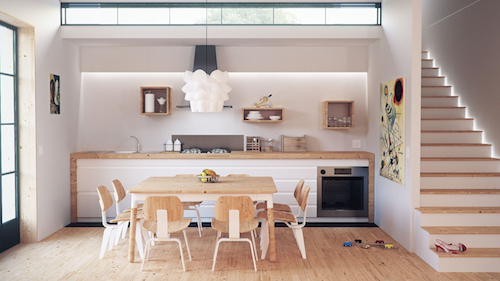 She asks people to approach cleaning category by category, throughout their house. You can read more about how she has her clients do it and give it a try yourself. 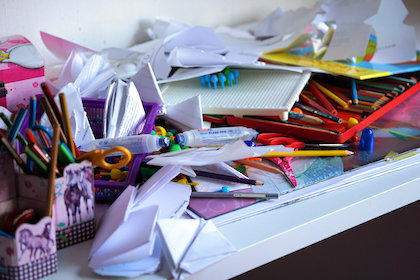 For myself, however, I have decided that this is really a second-level approach to be carried out only after the initial declutter of all my spaces. She does have one really great tidbit that I am using along with the “Buy Now” Button approach. This is the concept of items adding to the joy in your life. Pick up an item and ask yourself, “Does this spark joy?” In other words, does it give you a good feeling? This can be tricky and, owing to a great channeling that I did a few years back with the Lullites, I want to explain it to you a bit deeper, from the energetic level. Well, then, this is the actual energetic weight…Yes, it sparks joy. But, it doesn’t only spark joy. When you pick up a thing, or even glance at it, it can bring in all kinds of thoughts, memories and feelings. You look at the ribbon you won in the track meet, senior year of high school, what do you feel? Pride? Excitement? Joy? Accomplishment? Okay, that is your first reaction. However, is it also followed by other reactions and thought processes? Do you feel guilty because your best friend, who was a faster runner, sprained her ankle and couldn’t run that day? Do you feel sad because your Mom had to work and didn’t make it to the meet? Do you feel depressed because you’ve put on some weight and can’t run like that anymore? Well, then, this is the actual energetic weight of your track ribbon. Yes, it sparks joy. But, it doesn’t only spark joy. When you look at your books from college, what do you feel? Do you feel intelligent? Lucky? Or do you feel like you wasted your time? Do you feel sad your career has stagnated? Do you feel angry that you are now doing something else with your life? Jealous that your college roommate is now working in Rome? Then, you know the answer. The negative energy outweighs any joy you may initially feel. This is why I say to use the Spark Joy approach only after you have tried Buy It Now and several other approaches first. A spark is a quick thing, just like buying a new pair of shoes, it wears off and what does it leave in it’s wake? Yes, your mother’s wedding photos may spark joy, for a second. Is that a reason to keep them framed on the wall forever? What would you do with all of your mental and physical space if it wasn’t filled with things that only spark joy when you first pick them up or look at them? How often do you open that scrapbook from your spring break in Jamaica, 15 years ago? Often enough that the little joy sparks from back then are worth trading possible bonfires of joy in your present life? Process through your belongings, questioning the value of keeping each thing in your life. Ask yourself, does this only add value? Does this only bring positive thoughts and feelings? In this way it will be easier to determine how much you are getting from, and giving away to, each physical belonging. This is a new one that I am trying out to help me scale back the items I hold onto in my life. It is called the Benevolent Box. So often we keep things because they once sparked joy for us. We once really, really loved or wanted them. It may be something really beautiful, or valuable or useful. But, we have so many things that this thing rarely gets used or appreciated, or perhaps we liked it so much that we bought duplicates of it. In these cases you may have a hard time convincing yourself to send it off to a nameless, faceless person via the thrift shop. You will have an even harder time convincing yourself to send it to the landfill. Enter the benevolent box. Take a look at a thing you are having a hard time parting with and ask yourself if it might spark joy for someone you know. Could your local school use that old fiddle for their music program? Maybe your best friend used to always mention how much she loved that t-shirt? Does the lady next door love baking a heck of lot more and would actually use that earthenware pie plate? Add it to the benevolent box and then send it off to that new, happier home. I use this more and more and it feels great! You are saving your formerly beloved item from oblivion while putting a smile on the face of someone who actually needs it. Win/win! If you are holding onto something, or many somethings, that are just taking up space for the “someday” usage, or for that “just in case” scenario, try this method of decluttering. Just ask yourself, is this something that I can replace for less than $20 or in less than 20 minutes? Spare toothbrush. Painting tarp from the Dollar Store. Empty plant pot. Third pair of slippers. Bottle of NyQuil from 3 years ago. All of these things can be replaced easily and quickly if you discover, somewhere down the line, that you really needed them. Most likely, you won’t. In five years, Ryan Nicodemus of the Minimalists has had to replace 20/20 items only five times. That’s a cost of maybe $100 in five years. How much do you pay for the square footage to store those things for the same five years? How much do you pay in time searching through stuff and in wasted energy? If you can easily buy a replacement, let that unused excess go. Bye, bye just in case. Hello, world of opportunities! Decluttering is a winner! Whether or not your are on the road toward total minimalism or just toward increased happiness and freedom. While I am by no means close to the shining art gallery of a vision that I have for my ideal surroundings, I can already see some benefits. Every time a spend a day, or even just a few hours, sifting through the energy of my stuff and releasing things that no longer serve or inspire, I get a bounce in my step. Life seems a little less daunting, my mind a bit less confused. Sometimes I even step on the scale the next day to find that I have shed a pound of body weight during the process. Energy is indeed made manifest, if it slows down enough. This goes for our own physical and emotional vibrations as well. I feel that I am contributing to improvements in my mood and physical health as I release excess belongings. Not just for myself but, also to the benefit of the rest of my family members. Whether or not you feel inspired right this second to jump up and begin purging unnecessary items from your life, perhaps just take it under consideration. Leave it in your mind in the coming days and ponder it as you go about doing things in your life. You may notice that certain tasks take longer because you are always searching for lost things. Or that you’d rather get a take-out meal than tackle your kitchen. You may find yourself in a check-out line and realize that you are about to spend $100 on just a few small items. You may go to pay your credit card bill and suddenly understand that you could have arranged a borrowing deal with your sister instead of buying that expensive lawnmower that you use just 5 times a year. You may observe that when you visit a waiting room, a museum or a hotel room you feel less stressed, more at peace. This is because these places are usually open and uncluttered, sure, but also because you, personally have no responsibility for the things in that space. You are, for a short time, free. It is my belief that if we could all lighten our load a bit it would drastically improve our health, our relationships, our creativity, our connectedness and the livability of this place that we call Earth. If you’d like to explore the concept a bit further before deciding whether decluttering would benefit you, here are few additional resources. May your path lead you toward bright joy and amazing experiences! And, may the weight of “things” fall easily from your shoulders to put a new bounce in your step.